President Trump's disapproval rating saw a bump on Monday as controversy continued over his call to a Gold Star widow. 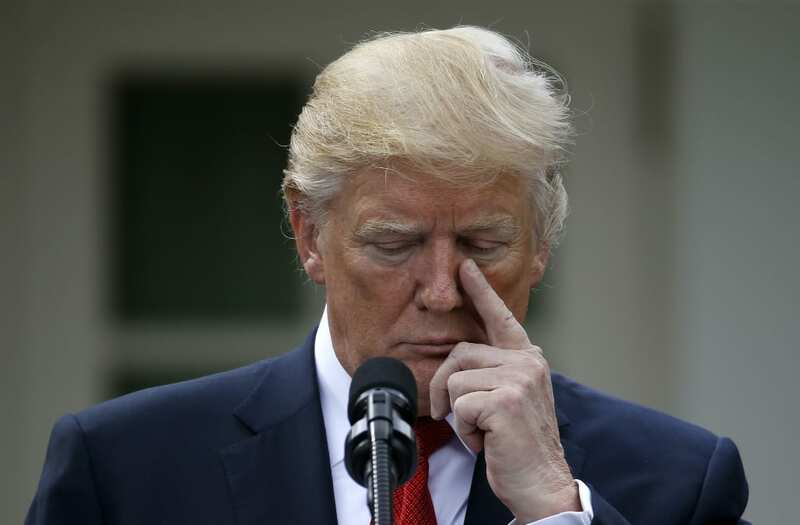 According to the daily presidential tracking poll from Rasmussen Reports, Trump has a 41 percent total approval rating and 58 percent total disapproval rating. This latest disapproval figure is Trump's highest since August 31. Trump had seen relatively steady approval ratings within the 41 to 39 percent realm in these early weeks of fall, but reports that first broke late last week surrounding his call to widow Myeshia Johnson may be causing his numbers to dip. The controversy began last week when Congresswoman Frederica Wilson told a local ABC affiliate that President Trump had told the wife of slain Sgt. La David Johnson -- a soldier who was one of four killed in an ambush in Niger -- that he "knew what he signed up for." "Yes, he said it," Wilson told the station. "It's so insensitive. He should have not have said that. He shouldn't have said it." The move from the Florida representative to expose Trump's remarks sparked a war of words, including tweets from Trump himself calling Wilson "wacky." Eventually, White House Chief of Staff John Kelly took the podium during a press briefing to support the president and comment on the matter as a member of the military who personally lost his own son to the war in Afghanistan. "If you’re not in the family, if you have never worn the uniform, if you have never been in combat, you can’t imagine how to make that phone call," the former Marine general said. "It stuns me that a member of Congress would have listened in on that conversation. Absolutely stuns me." The back and forth went a step further on Monday morning when Johnson's widow appeared on "Good Morning America," shining light on Trump's call and confirming that the president forgot her husband's name. "The president said that he (her husband) knew what he signed up for, but it hurts anyway," Johnson said. "And it made me cry because I was very angry at the tone of his voice and how he couldn’t remember my husband’s name." Trump fired back at the statement via Twitter, saying that he spoke the fallen soldier's name "without hesitation." "I had a very respectful conversation with widow of Sgt. La David Johnson," Trump tweeted. "And spoke his name from beginning, without hesitation!" As investigations into what -- if anything -- went wrong in Niger continue, Trump's back and forth with relatives of a fallen member of the U.S. armed forces could mean potentially damming fallout for the Republican commander in chief.